CHICAGO, IL--(Marketwire - February 29, 2008) - Tara Gold Resources Corp. (PINKSHEETS: TRGD) (FRANKFURT: T8N) is pleased to announce assay results from 14 drill holes in the San Miguel Zone of its San Miguel project in the Guazapares Mining District, Mexico. Drill holes SM-05 to SM-18 were drilled 30-90 meters apart and were designed to intercept the San Miguel vein structure approximately 50-150 meters below the surface. These drill holes extend the high grade gold and silver mineralization found in holes SM-01 to SM-04 (reported Jan. 24, 2008). The nature of this mineralization suggests that the program found what is commonly known in Mexico as a Clavo; a mineralized body inside a vein with small dimensions and high grades. 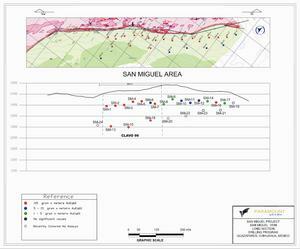 In light of these assay results, this part of the area in the San Miguel zone will be referred to as 'Clavo 99.' The mineralization in 'Clavo 99' was extended by approximately 100m down dip: SM-13 (12.53m of 1.38 g/t Au Eq. and 1.03m of 9.26 g/t Au), SM-15 (4.02m of 13.87 g/t Au Eq.) and SM-18 (8.03m of 2.22 g/t Au Eq. ), and 100m along strike to the southeast: SM-05 (5.06m of 3.71 g/t Au Eq.) and SM-07 (6.65m of 5.18 g/t Au Eq.). For a complete view of all drill hole locations from the San Miguel vein, please see the attached longitudinal section at the end of this press release. True    Gold    Silver  Equiv. Equiv. Paramount has commented that, "These results confirm the continuity of the gold and silver mineralization from the surface down to at least 150 meters of depth. They also extend the mineralization to 250 meters along strike and it remains open. These grades and volumes are consistent with and substantiate the discovery of a high-grade ore shoot similar to those at nearby Palmarejo. The geological characteristics of the vein structure strongly suggest that similar mineralization may persist to a depth of 250 meters or more." Currently, 'Clavo 99' is approximately 275 m wide and goes to a depth of 150 m. Assays are pending on holes SM-19 to SM-24, which were drilled to test the strike length potential of the system. Paramount is currently drilling the San Miguel vein deeper and along strike to better define 'Clavo 99' and to test for other Clavos. Holes SM-34 and SM-35, which have just been sent to ALS Chemex for assaying, were drilled to test the Clavo to 200 m of depth. SM-34 was drilled 50 meters below SM-15, and SM-35 was drilled 50 meters below SM-18 and SM-20. Paramount takes detailed digital photos of the entire core before it is cut by saw to half core which is assayed at ALS Chemex's Vancouver laboratory. As part of quality assurance, quality control (QA/QC), Paramount has put into place a detailed program of periodically introducing certified standards, blanks and duplicates into the sample stream. Half-core samples are being retained on site for verification and reference purposes. Tara Gold Resources Corp. is a growth-oriented precious metals exploration and development company with existing production plants. It is management's objective to become a significant gold and precious metals producer by re-initiating and increasing production levels at La Currita, Lluvia de Oro and Picacho, and developing the San Miguel, La Millonaria, Las Minitas and Curcurpe projects in Mexico. We continue to acquire other advanced-stage projects and/or producing mines in one of the most prolific precious metal districts in the world. For more information, please visit the Company's web site at: http://www.TaraGoldResources.com.